A corporate seminar with Karen Hoyos will transform your business from the inside out! Karen’s corporate seminars are just as motivational and inspiring as her personal events, but they have been specially tailored to build the kinds of skills needed for a successful transformational business. Karen uses her captivating content and interactive exercises to train business leaders to find, share and maximize the impact of their gifts to serve the world and create financial success doing what they love. 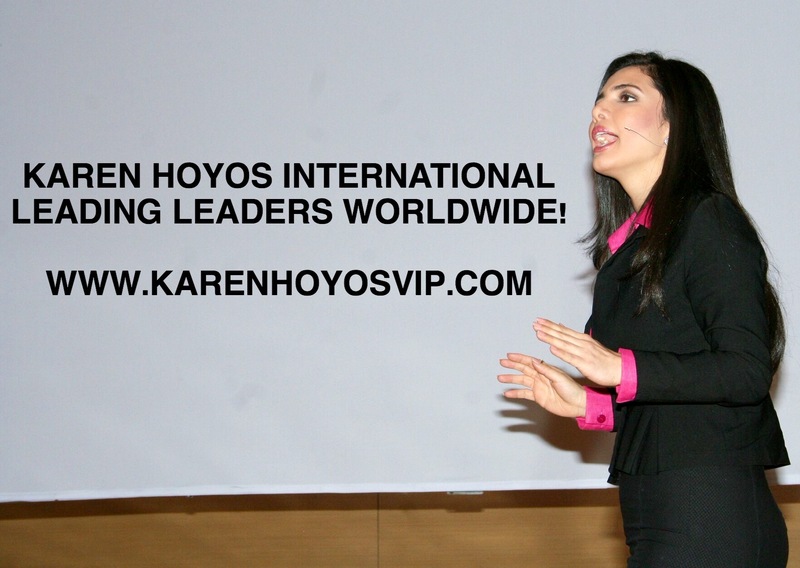 For your next event, bring in Karen Hoyos, a powerful, beautiful and dynamic speaker who will empower your people to action. Her inspiring journey of overcoming domestic violence from a Colombian immigrant single mom of twins to a successful entrepreneur and global leader will touch the hearts of your people while it challenges their beliefs about success, and motivates them into action. Karen is one of the most extraordinary experts on transformation and breakthrough results in the world. She gets to the root causes of procrastination, fear and inactivity — and shows your team how to overcome these fears to win in every area of their life! Her inspiring message is exactly what your people need to get past uncertainty and indecision… and into action that gets powerful results. You get fired-up, productive people, and you’ll look like a hero. More importantly, you’ll see the measurable results, long after the training is over. Karen’s unique and captivating stories could be told by no one else. Your people receive a program that’s effective, fun, and filled with usable information and interactive exercises on how to accomplish your team vision. Karen was selected as one of the most inspiring women in USA along with the famous singer Shakira by the international magazine Siempre Mujer . Give Karen Hoyos the opening keynote and kick off your event tremendously, or have her as your closing keynoter and send your people out the door empowered into action. Either way, your conference will be more successful, your people will thank you! Karen is often booked months in advance, so move fast! This extraordinary seminar will train your team to raise productivity to a higher, more effective level resulting in increased profitability. In The essence of Success Karen will give your group specific tools that are easy to apply. These strategies have been designed and tested by millions of people around the world. They lead to increased production capacity and immediate results in business as well as in personal life. Vision: Create clear and effective individual and collective goals. Belief: Reprogramming and mental empowerment. Purpose: Identify clearly what is their life’s purpose and use it as the “why” behind their success with your organization. Action: The tool for creating measurable and lasting results NOW! This training will teach your group the principles to tap into the awesome power they possess to produce more by becoming more. An exclusive encounter with the power of influence and success! Sales and interaction skills at a transformational level. How to create strategic alliances with other leaders. Practice a new plateau of leading consciousness. How to influence others in a soul level generating measurable & lasting results. Set new standards that will edify the impact of their work & actions. How to leave a legacy of global change by raising their vibration while manifesting their vision. This program will show you and your team how to anticipate trends, gets out in front of them and become indispensable. Karen will get to the root to their disempowering beliefs and show your team how to overcome fear and win in every area of life. This dynamic program will show your people the ultimate sales and influence techniques. How to sell effectively with integrity and responsibility. All keynote programs are available from 60 to 120 minutes based upon your needs and can be re-titled to match the theme of your event. If you have a limited budget, Miss Karen can deliver your programs through Skype or streaming Internet, for one half of the live fee, plus a small cost for the technology. All programs are available based upon your needs and can be re-titled to match the theme of your event. If you are looking for a customized event Karen Hoyos can serve you as well.